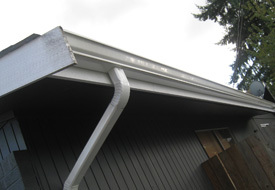 JS Gutters has been exceeding expectations all over Washington for decades now. But don’t just take our word for it; read some things that our loyal customers have said about us. We’re eager for you to join our family of highly satisfied customers. Call JS Gutters. 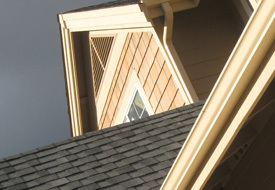 for your free gutter estimate. 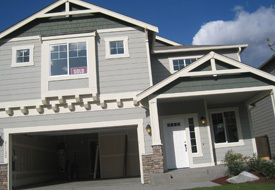 Reach us at Kent: 253-220-6970, Mt. Vernon: 360-707-4447. 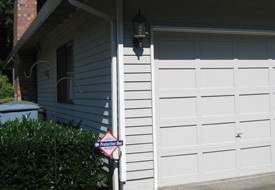 We’re available Monday-Friday from 7-4 p.m.
[The sales staff and installer were very professional. They installed like they said they would and were done in 5 hours. They worked with my wife and I to pick out colors and styles. I wanted a rainchain installed and they were more than willing to do so. GREAT COMPANY. P.S. 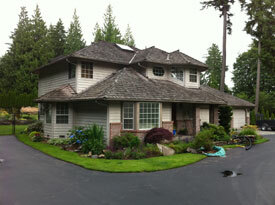 I had three estimates done and JS Contracting were the only one's that even called back. 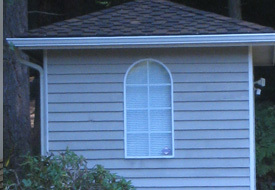 Complete gutter replacement (with the exception of downspouts) after a reproofing project. We actually found out that JS Gutters was working closely with the contractor (Century Roofing) we hired for our roofing project. Debbie Roice came out promptly for the estimate and offered lots of options. She gave me quotes for full and partial replacement as well as gutter cover pricing if I was interested. 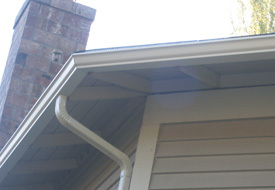 We elected to replace the gutters while retaining the downspouts which are painted. 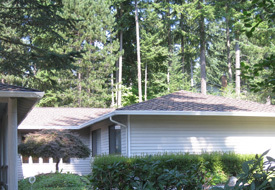 The project was scheduled, and the gutters were installed two days after the reroof was completed. 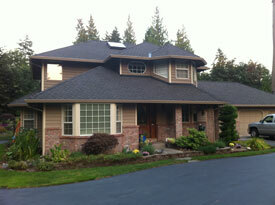 When the installers arrived, they mentioned how well the roof had been prepped for the job. They did a great job! Very professional with great attitudes. Our new gutters look great. A nice finishing touch to our roofing project. I met with Deborah Roice in July 2009 at the recommendation of Tom Pritchett of Century Roofing. 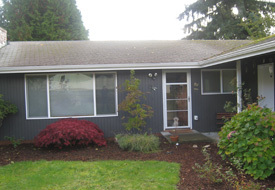 She gave us an estimate for the replacement of our gutter system with the recommendation of using the 3x4 larger downspouts to accommodate the rain in our area. She also recommend the drain guards to help catch any debris. Chris and Rob arrived in the time frame expected and were finished in 3 1/2 hours. Chris realized that 1 downspout and drain guard was left off the diagram so he called to have additional material delivered. This added a few more dollars to the estimate but was still under our budget. They did a great job visually but will know more with the next rain storm that comes through. Old gutters and downspouts were removed by the roofing contractor who replaced our roof just prior to the installation of the gutters. 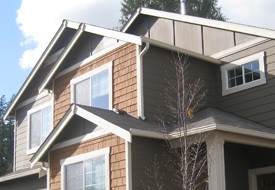 Our gutter contractor worked with the roofing contractor on a scheduled timeline. Work was performed as stated on the contract. They did not require homeowner to be present to complete the work. Customer service and follow-up was excellent. “Just a brief note to tell you what a great job your installation team did for us. 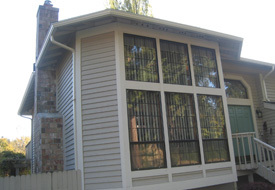 We appreciated their efficient, professional workmanship as well as their friendly demeanor. 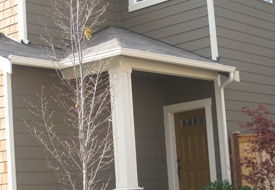 I had the Leaf Solutions System installed on my house back in September of 2004. I have been nothing but pleased with the outcome of your product. The fact that I don’t have to get on my roof anymore to clean out my gutters makes it all worthwhile. Living on an island surrounded by Douglas Fir trees, my house is constantly bombarded with cones, needles, and other types of debris. Anytime a storm came through, I was out to clean the gutters yet again. 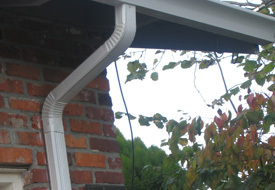 I looked into a couple of gutter cover products to solve this problem. The least expensive option was a standard ‘reverse curl’ system. However, this would not work with my metal roof system. So, I next get a bid from Leaf Filter. There bid of about $35/foot was vastly too expensive. So, I thought that I was dead in the water. Then my architect mentioned your product. I gave Jim a call and he came right over. Gave me a bid of about half of Leaf Filter. I said let’s do it. The installers were over the following week. Cleaning of the gutters and install of the new system was completed in about 4 hours. The system works great! Gutter cleaning is now a thing of the past. I wish I had known about your product when my house was being built. I would have had your product installed at that time. 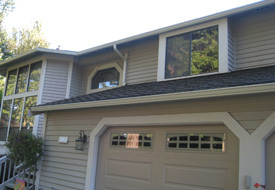 “Gary and I are delighted with the new gutters and downspouts and the new gutter guards. We’ve had lots of rain and have no problems. The new gutters look so good and any leaves that land on the gutters are blown off with the wind. And you can hear the water running freely down the new larger downspouts. And we are happy we wont have to get on the stepladder to clean the gutters. Both Tony and Jason did a fabulous job for us. We are very happy with their work. 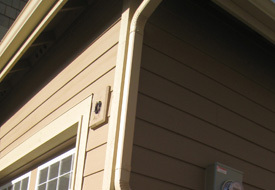 Our new gutters look beautiful – and the dark gray color matches perfectly with our house. 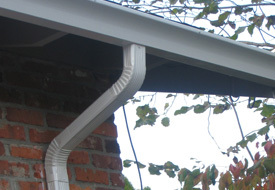 We’ve had a couple of neighbors come by to let us know they like our new gutters and the gutter guard – and are interested in possibly getting new gutters and gutter guards plus the downspouts sometime this coming spring. It also helped for me to have a sample of the gutter guard to show them – they are really impressed. 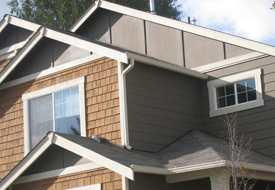 As you noticed, our house is set in a way that people see our gutters and gutter guards from the street when they drive or walk past us. We are looking forward to have the rest of the house done sometime in January – we will contact you then to set up a schedule. We again want to thank you for setting up our appointment so quickly. 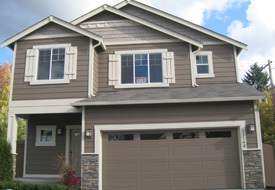 We were really impressed with your knowledge of your product at the Seattle Home Show – and your follow-up phone call after the installation of the gutters and gutter guards and the downspouts – to check with us how everything is working out. 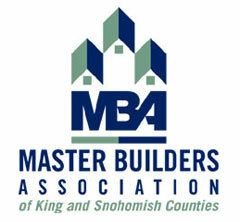 One of the reasons why we attended the Seattle Home Show was to learn what new products were available for us. We knew we needed new gutters and wanted to add new guards. And you convinced us that your new product was what we needed. The price is right as well. My wife and I recently re-roofed, painted and replaced the gutters on our home. 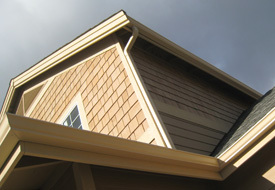 We solicited bids from three different gutter companies one of which was J.S. Contracting. We had two downspouts from our second story that drained onto our main floor roof that we were hoping to eliminate. The first two contractors flat out told me that there was no way that the gutters would be able to handle the increased capacity and that the downspouts would have to remain. When the estimator from JS Contracting came out, within five minutes he had redesigned the configuration and recommended that we use a higher capacity gutter. 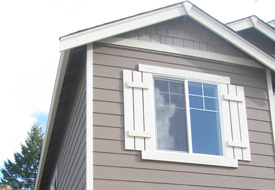 Not only did the bid come back lower, the color selection and different profiles that they offered were far superior to their competitors.The installation crew was on time and their workmanship was exceptional. 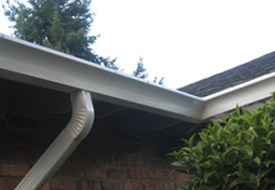 We would highly recommend JS Contracting to anyone who is in the market for new gutters!